1. Why study the tables? 4. Are timed drills necessary? 7. What about mnemonic helps? Why study the times tables? I feel that learning the multiplication tables is even more important than mastering addition and subtraction facts. Why? Because knowing the tables well facilitates the learning of basic division facts, multidigit multiplication, long division, most fraction math, and factoring. Even in algebra you will still need to be able to simplify rational expressions and factor polynomials, perhaps even multiply matrices. Or, we can say it this way: if you child does not know the tables, he/she will have a terrible time mastering all those topics. I'm not saying children won't learn those topics conceptually—I mean they will have hard time completing the problems and exercises quickly, and can instead get all "bogged down" just by the multiplications. That is why I feel every teacher/parent should put forth a good effort for their students to learn the times tables. Spend 1-2 months on it. It can pay off! Yet, many students in today's world struggle with the tables. This article explains in detail how to go about teaching multiplication tables in a structured manner, followed by other helpful suggestions for practice. This method is aimed at memorizing a certain times table by using so-called STRUCTURED DRILL. It differs from random drill substantially in the fact that we actually use the structure of each table in the drill. You should only start the drills after the child understands the concept of multiplication itself. Please see this list of free VIDEOS (one for each table) that teach the tables from 2 to 12 using this structured drill. When using this method (or any drilling), be sure to explain to the student that the goal is to memorize the facts—to recall them from memory—and not to get the answers by counting or any other method. Just like your child has probably already memorized your address and phone number, now she or he is going to memorize some math facts. You should expect the child to answer immediately when you are drilling. If he or she doesn't know the answer by heart (from memory), then tell him or her the right answer. Short drill sessions are usually best. For example, you might drill for five or ten minutes at a time, depending on the attention span of the child. Pencil and paper activities that the student completes alone do not work really well for memorizing facts because the child can get the answers by counting and not from memory. Proper drill requires an investment in time from the instructor. If you can, utilize older siblings, too, in the task of drilling. Here's a five-step method for memorization, taken from my book Math Mammoth Multiplication 1. Normally only a few of the steps would be included in any one session, depending on the child's concentration and ability. Have the table to be learned already written on paper. Here we will use the table of three as an example. The first task is to memorize the list of answers (the skip-counting list). Have your child study the first half of the skip-counting list (3, 6, 9, 12, 15, 18), saying the numbers aloud while pointing to the answers one by one with a finger or a pen. This technique uses the senses of seeing, hearing, and touch simultaneously to fix the information in the brain. After he has gone through the list a few times, ask him to repeat it from memory. Expect your child to answer, and don't give her the answers too easily, because ONLY by putting forth an effort will she memorize the facts. Just like the muscles, the mind needs exercise to become stronger. Require her to memorize the skip-counting list both forwards and backwards. Keep practicing until she can "rattle off" the first list of 3, 6, 9, 12, 15, 18. With some tables, like the tables of 2, 5, and 10, it helps to point out the pattern in them. The pattern in table of 9 is more subtle but still useful. Then tackle the last half of the list: 21, 24, 27, 30, 33, 36. Do the same things you did with the first half of the list. Next, work with the whole list of answers (the skip-counting list). Practice the list going up and down until it goes smoothly and easily. These steps may be enough for one day. But be sure to review again later in the day. Next, practice individual problems randomly while keeping the whole list of problems visible to the student (without the answers of course). Cover the answers. You can ask orally ("What is 5 times 3? "), pointing to the problem on the chart. I recommend reading the question aloud while simultaneously pointing to the problem because, again, using multiple senses helps to fix the information in the mind better. Watch the video to see how this is done. The goal at this stage is to associate each answer 3, 6, 9, 12, 15, 18, 21, 24, 27, 30, 33, 36, with a certain multiplication fact (such as 7 × 3). You can also mix facts from earlier tables that she already knows with these new problems and drill them together with flashcards. The last step is to do the drill the other way around. Now you say the answer ("21"), and the student has to produce the problem ("3 × 7"). Keep the table visible, hide the problems (but not the asnwers), and point to the answers in a random order. This technique can also work the other way around, where the student says the answers, and you produce the problems. Give wrong answers sometimes, too, to check them out. As an extension, you can say answers from several tables that you've studied and have the student give the corresponding problem. Sometimes there are several answers. For example, 36, 30, 24, and 20 are in several different times tables. This is an especially good exercise as it prepares for the concepts of division and factoring. The memorization probably won't happen overnight. On subsequent days, you can mix steps 1-5 (normally you won't need to concentrate too much on steps 1 and 2 after the initial practice). This kind of drilling takes a little time and effort from the teacher, but it can be very effective. Homeschoolers can obviously do some of it while going about other tasks, such as traveling in the car and so on. 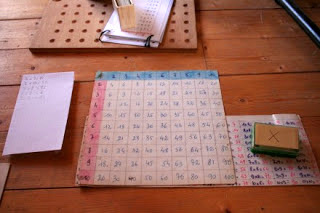 While you are doing this table by table, you can also try to teach the process to your child, so that she will learn how to do the memorization herself. She can hide the answers and try to reproduce the list in her mind. Check out also my series of free videos for the multiplication tables, one video for each table, using this structured drill. Hang on your wall a 12 by 12 grid (or 10 by 10) with the skip-counting patterns written in it. Remind your child to glance at it several times a day. It can work wonders for visual students! Hang another poster beside it, with an empty grid, in which the child fills in those facts he has mastered. See an example of how I use the 12x12 grid at the end of the lesson for the table of 3 (taken from my book Math Mammoth Multiplication 1). Recite the skip-counting lists or multiplication facts aloud just before going to bed. This can turn them into mastered facts by the next morning. Use this free online practice program by David Chandler that helps you practice and master the multiplication tables — using the same order of learning the tables as in my book and my curriculum! This tool also practices the tables both forwards and backwards at the same time — which is exactly the approach I've taken in my books and in my videos for the multiplication tables. Practicing them both ways is so great, because it allows the students to master division facts "in disguise" at the same time. Multiplication Tables Online Practice here at MathMammoth.com — you can choose timed or not timed practice, the number of questions, and the tables you want to practice. Math Magician games has a simple 1-minute countdown, and if you answer 20 questions in that time, you get an award. Sheppard Software is filled with several types of games just for math facts practice, including timed practice. Some of the games there don't time you but give you more points the faster you go. Yet for other students, timed drills may be counterproductive and they may end up in tears and frustration. The proof is in the pudding: just try it and see how it goes. Games are very helpful once you get to the "random drilling" stage (after having completed the structured drills). I have compiled a LONG list of online multiplication games and software here. Computer-based drilling can be very rewarding to children when they begin to notice that they are truly learning the facts and are becoming able to complete the drills successfully. They can actually come to enjoy the process. This simple card game is also noteworthy (the "Product War" version). Essentially, each player is dealt two cards face up, players multiply those, and the person with highest product captures all cards in that round. Or, try a dice game called Damult Dice. Music (songs) can be very effective in helping children to learn their multiplication tables. It works with the brain in manners that we are not yet fully aware of, but it is certain that music enhances learning and brain function. You can simply use a familiar tune (Row, Row, Row Your Boat; Happy Birthday, B-i-n-g-o, or any other tune the child already knows), and just add the numbers in place of the words. Some children may like rap better, and those tunes work, too. Or, if you'd like to have songs that are especially written for multiplication tables, check out my review of Multiplication Mountain CD by Hap Palmer. Using music and movement can be especially helpful for students who have math anxiety because it doesn't seem like "math" to them. By circumventing their 'mental block', they can learn the tables without difficulties—they see it as fun, and the 'math triggers' that the mind uses to 'block' the brain and produce the 'fear response' are never stimulated. Also, younger siblings often learn the songs (and should be encouraged to learn) at the same time. What about mnemonic helps for multiplication tables? Mnemonic devices in themselves are not bad. We use them all the time, in everyday life situations. Maybe you have a phone number that you divide into 2-digit numbers, and remember that it has successive numbers, or doubles, etc. I once memorized a certain 4-digit pin number by thinking of it as two 2-digit numbers, and remembering that the latter was 9 less than the first... but after a while I remembered it without that. For example, Times Tales is a mnemonic program for multiplication tables. It associates a silly story and picture with each "difficult" upper times tables fact. For example, if a child learns 8 × 7 by using Times Tales, the child will remember a silly picture of "lady eight" and the character for seven driving in a car, and remember "It's 56." That is not too much different from using a rhyme such as "5, 6, 7, 8, fifty-six is seven times 8." Such a program can be a confidence booster as well. Now, for some children these silly stories do not work because they don't easily remember the stories, and then it can cause frustration. Also, older children may not enjoy the silly stories anymore. All such "helps" are fine in their place, but you have make sure that the mnemonic "help" does not end up being an additional burden in itself. Keep in mind that mnemonic helps are of course only additional (supplemental) resources, and don't replace studying the multiplication concept itself or studying the structures in the tables. There is a BALANCE, as in everything. If you've already expended a considerable amount of effort and the child is not retaining the tables, please don't make the multiplication tables to be the reason why your student hates math. You can back off and try again later. Some give their students a "crutch"—tables written out—and eventually the child notices how slow it makes him/her having to check the answers in the table instead of knowing them, and decides to memorize them. Simple and free online practice here at MathMammoth.com — you can choose timed or not timed practice, the number of questions, and the tables you want to practice. A set of videos that employ the structured drill method for the multiplication tables. I just wanted to thank you for this curriculum! We started homeschooling this year, 4th grade. My daughter started out slow, and I wasn't sure this was the right product for her. Then I figured out that she didn't know her math facts well enough to move on. So I just went back to the math facts chapters in earlier grades and am having her work on those. Your multiplication worksheets are amazing! Your way of teaching them is so great that she's really picking them up quickly and we'll soon be able to move on to the 4th grade curriculum. You really DO teach the concepts, not just problem solving. Unlike many homeschoolers, I will never have to spend more money on math program after math program, trying to find one that works. Thank you!! By the way, I just want you to know what a Godsend your materials have been. As a Math lover myself I was thrilled to come across a curriculum that taught Math exactly how I "think" it. Your explanations are wonderful, and the amount of practice perfect. After struggling with Math for 5 years, my 6th grader has grown in leaps and bounds. She actually enjoys Math now. Prior to getting your Math, she spent three years working on her times tables using flashcards, drill, computer games, mnemonic devices and programs with rhyming stories in conjunction with her textbooks. All to no avail. After 5 months using your products and methods, she has memorized all her multiplication facts, and zoomed through to long division. My 5 year old has been listening and actually knows skip counting twos, threes, fours and fives. Apparently your methods work. THANK YOU so very much for all your work. Just want to thank you for Math Mammoth! Very affordable. I have thrown everything else out and this is all we are using. My math-hating daughter who just finished third grade is doing the multiplication from the blue series to prepare for 4th grade next year. She is doing this on her own over the summer because she likes it! Never thought I'd see that. She has really struggled with multiplication and she says this is making it so much easier for her to understand. I love the ability to use the blue series to fill in the gaps of what they don't "get" the first time around. This is so customizable for different kids. I love the pdf format also. I can put the book together in any order I want. I love the no teacher's manual thing. With three kids it is hard to shuffle around 3 books. This is so much better because when each kid has questions they already have it all with them when they bring it to me. I was so excited to find this. Wish I had found it a couple of years ago! Thank you for this curriculum and thank you for making it affordable. I bought all 6 levels at once. I could never afford to do that with any other curriculum. This has ended the struggle (for the most part) with my daughter. Thank you for making teaching my kids math affordable, easy, and even enjoyable! Maria, I just wanted to send you a quick message to say a heartfelt thank you for giving me the tools to teach math so well to my children. 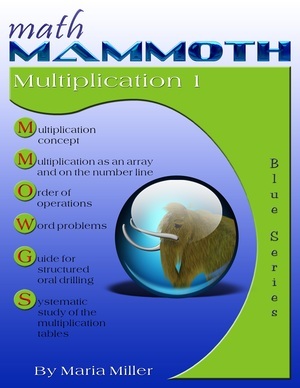 It is early days for me with Math Mammoth materials, having just ordered the Light Blue 1A and 3A/B texts from Rainbow Resource (found them because of a recommendation by one of their q&a people). Before staying home with my children, I taught 1st and 2nd grades in the public schools, mostly as reading/writing teacher. Since I want to go back to teaching when my youngest is older, my children are in public school but I afterschool them to fill in the gaps or enrich. Even with all my "training," I have been really puzzled about how best to teach math to my older boys. The curriculum in their school just doesn't seem to be systematic or comprehensive enough. I think the teachers do their best with the materials they are given. However, my 3rd grader is challenged by mastering his multiplication facts and your email today, along with the video, is so illuminating! I never would have thought to teach the tables this way. Thank you so much! I wish all public school teachers had access to such wonderful materials as you provide (well they do if they have an internet connection but you know the school systems are throwing so much else at them). I hope you are getting lots of positive feedback from many people for your efforts because I am sure your efforts are benefiting many. Thank you for sharing your knowledge!! !